Continuing on with our Star Wars series my friends and I discuss the masterpiece Empire Strikes Back. Would love your comments and feedback. Thanks! Yesterday my friends Abby, Jeremy and I discussed what is widely considered the best of the Star Wars films: Empire Strikes Back. I watched Empire Strikes Back twice last week and each time I was truly blown away by it. 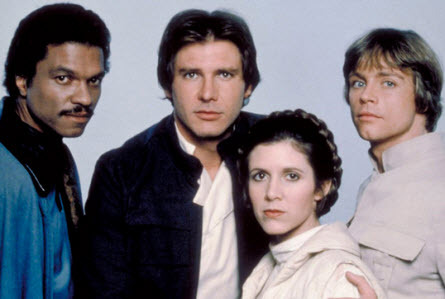 There was a new director for Empire Strikes Back, Irvin Kershner and new writers Leigh Brackett and Lawrence Kasdan, and you can really feel their influence on the finished film. I am not overstating my feeling when I say every decision they made works. There isn’t anything I would change in the film. The characters are the first stand-out in Empire Strikes Back. You get some new characters in Yoda who is a tough taskmaster to Luke as he teaches him about the force. You also get to know Lando Calrissian who at one moment betrays the team but there may be more too it than that. I haven’t seen a single SW movie and I’m hoping to keep my streak up next month.